Weather. One of the most fundamental aspects of our hobby and if we get it wrong, it can mean more than a rough landing. Planning your flying using accurate weather data is important but it’s also sometimes challenging. 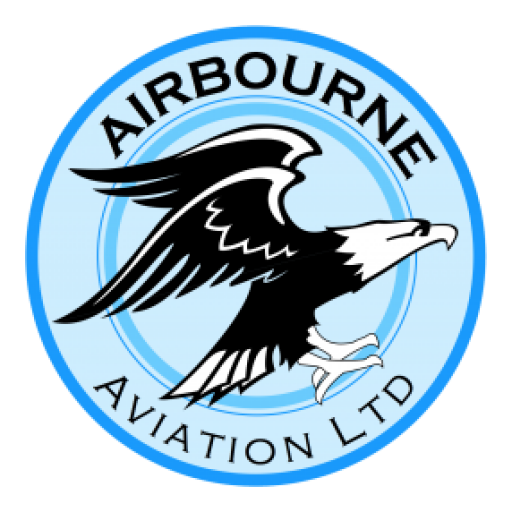 After all, the weather is very unpredictable and if you’re flying further afield, you’ve got to take into consideration a much wider array of possible weather conditions and changes. 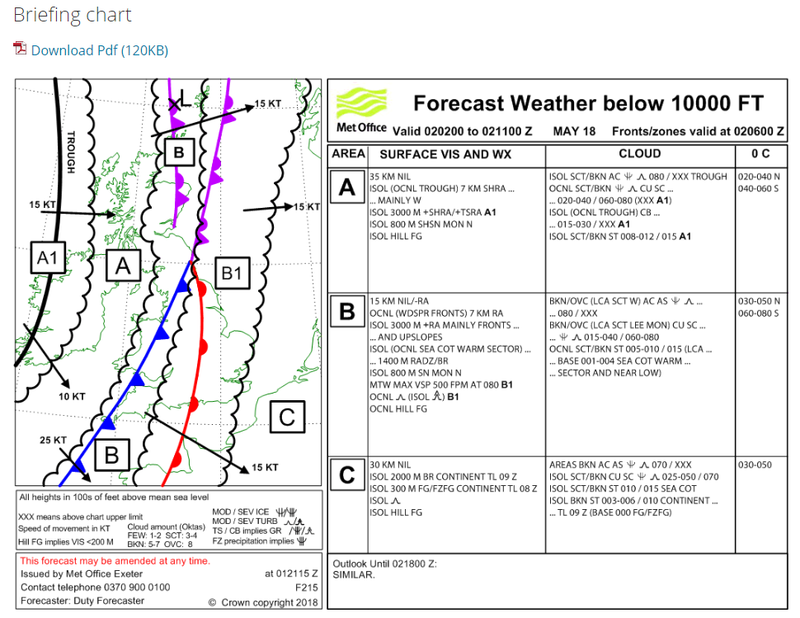 We’ve put together a collection of useful weather websites (some with mobile apps) for you to use during your flight planning and for general interest. 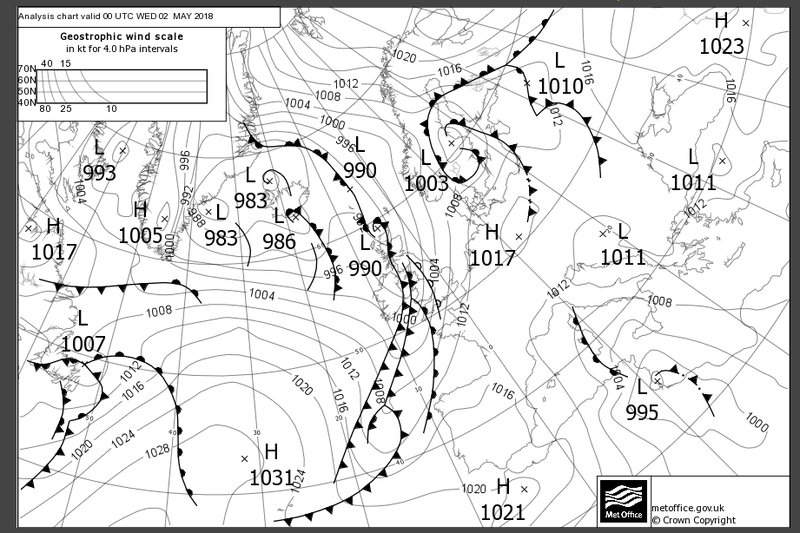 Certainly, you’re the first port of call on the day of flying, we recommend also taking the time to learn (using the Met online learning resources available) what the abbreviations and symbols mean on the infamous F215 charts from the Met Office. This chart provides good detail and information for areas and conditions throughout the day and you’re probably already familiar with them or, have at least heard of them! 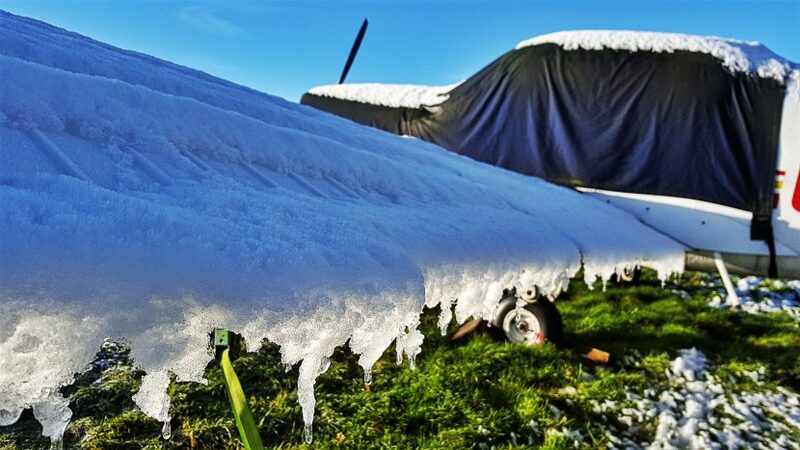 For general conditions and forecasts in the lead up to your flight, you can look at the general forecasts made by the Met Office on their website. This provides useful overviews in the lead up to your flight which is good for giving you a more holistic perspective of what the weather is doing and how it is changing. 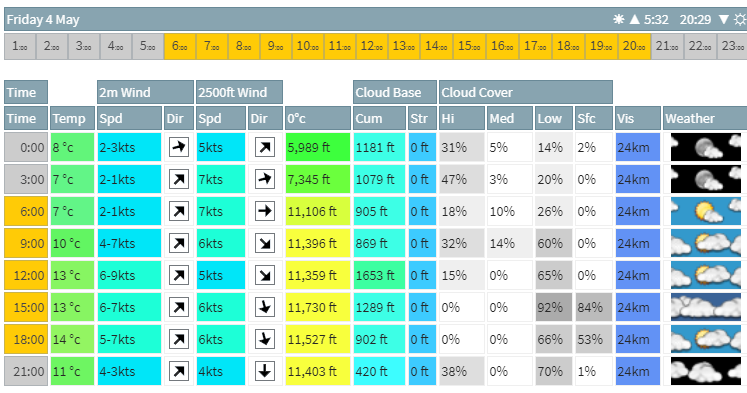 Metcheck is an interesting website with an assortment of data and detail. It’s useful for using in combination with other weather forecast products for an overview and to get an idea of conditions on the day. They have a dedicated ‘aviation’ section which changes the data shown to be relevant to us pilots. You can also easily change the various metrics used between measurements. 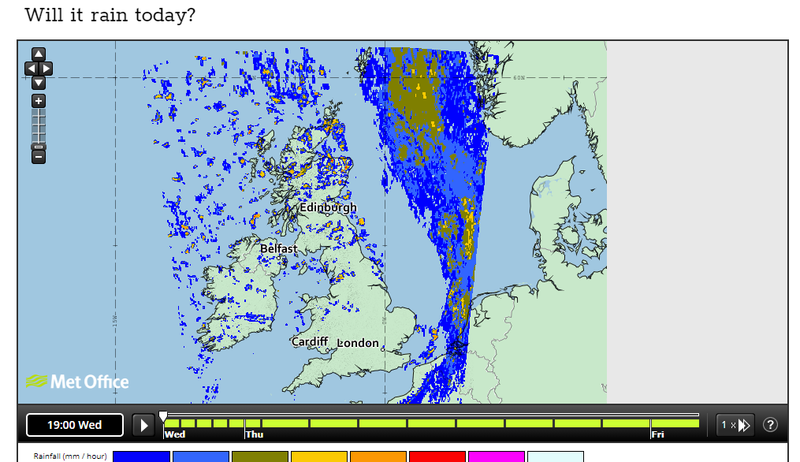 A rain radar over the UK works well if you combine the picture this information is giving you with other tools such as the Met Office general forecasts. 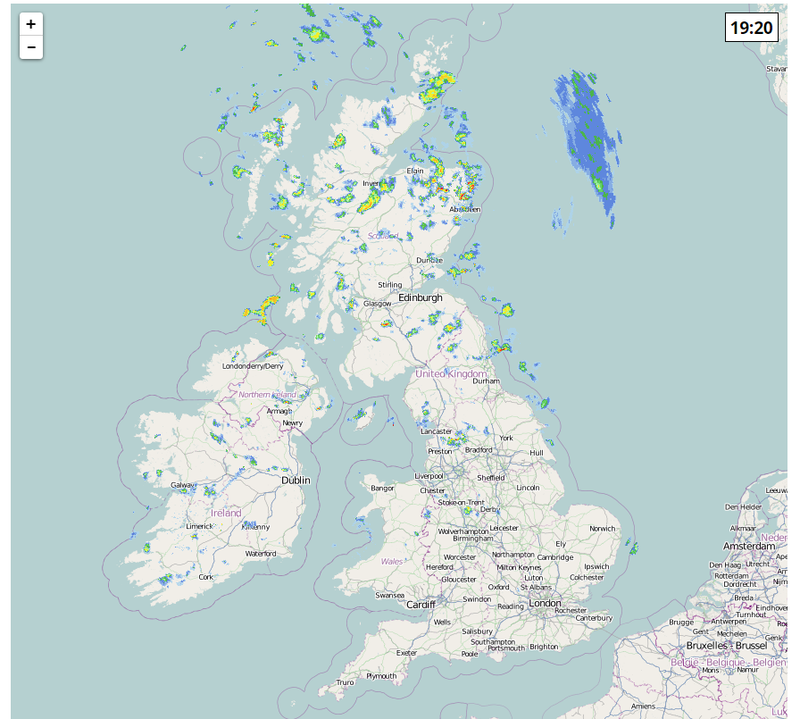 Other radar products and the surface pressure charts give you a useful overview of the weather from which you can see how it will evolve and change. This should be a go-to piece of weather information at least a week before you fly so that you can build up a good picture of the weather. This not only gives good indications of what’s happening but gives information on what could be happening over the next few days. Don’t know how to read these weather maps? We recommend learning and there are plenty of resources on YouTube alongside a plethora of information available on the Met Office website. Similar to the Met Office version but we like this one because it’s clear and easy to read. Another useful chart that shows where the rain is and expected to be giving you more information for planning those flights. 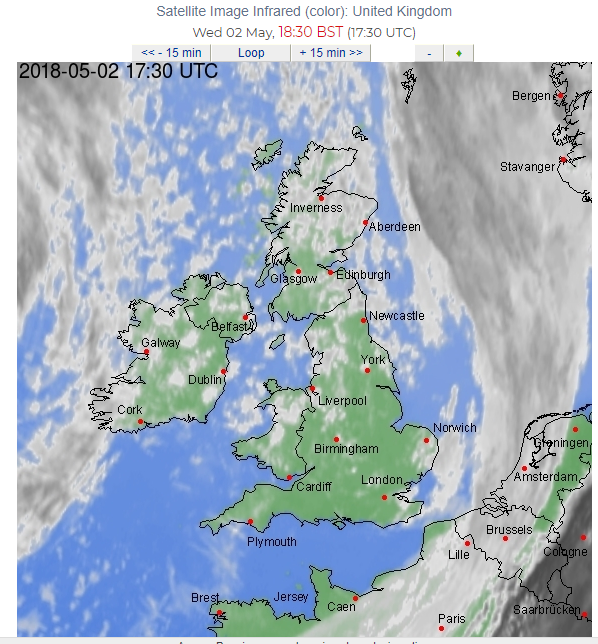 Satellite imagery (you can find infrared ones to see nighttime images) work really well with the surface pressure charts enabling you to see where the frontal weather is. From that, you can see where clouds are, where they’re forming and what kind of weather you’re likely to experience at different places. If you look at this and the surface pressure charts enough, you can start to estimate what the weather will be with some surprising accuracy! This website has a Kaleidoscope of weather information on it! What we find most useful though is the cloud base estimations. 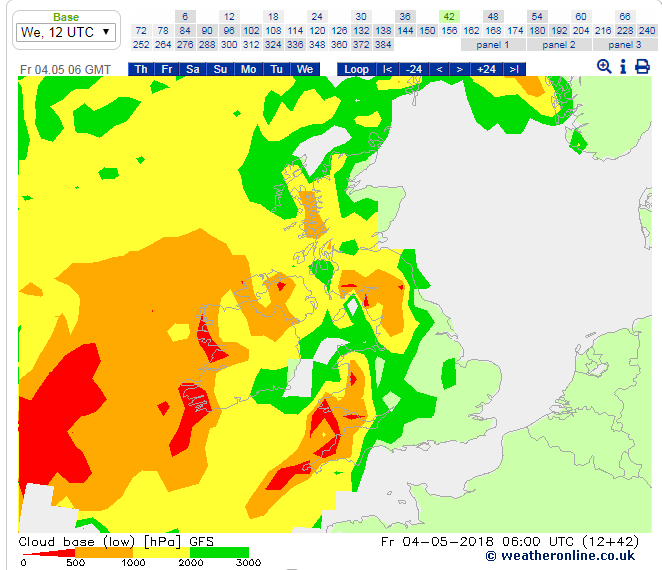 Not always accurate but useful for getting an idea of what the cloud may look like en-route and best used in combination with other sources of data with colour coded cloud heights for easy reading. 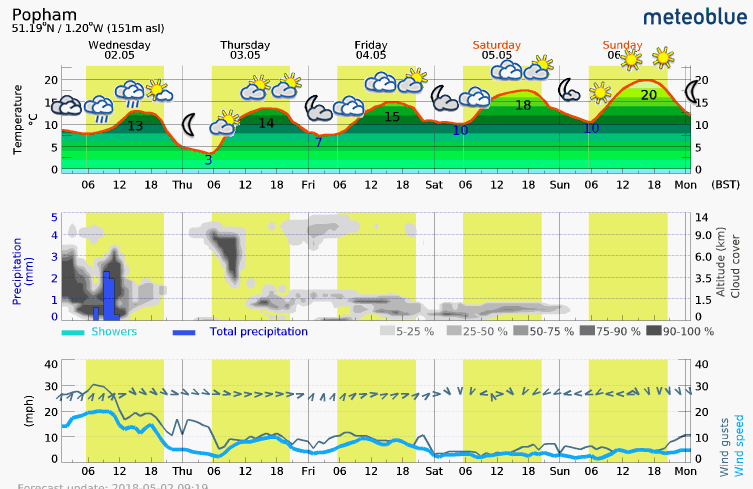 Meteoblue provides some of my favourite weather charts – the meteogram. Meteograms provide a cross-section of the weather for the day and specifically, I like the cloud base estimations. Again, not always accurate so use in combination with other tools and products, but great for taking a look at how you might expect the day to change in respect of cloud bases and density. Similar to those above, YR is the Swedish equivalent of the Met Office. They have some great ways of displaying data including their own meteograms. They are very easy to read, simple and you have a slightly more complex version with more information contained within. Cloud bases are given (although is big steps) alongside dew point and surface temperature estimations allowing you to make those cloud base forecasts. If you have some time, I recommend getting to know Skew-T graphs. They’re a more reliable way of understanding cloud bases and cloud tops using other sets of observable information. They do look complicated, but once you understand how to read them, you’ll most likely find these featuring in your regular tool bag of weather sites to check for flight planning! A favourite tool amongst glider pilots, RASP charts show lift data (estimated) alongside some interesting cloud base information. Intended predominantly for glider pilots it still contains some very useful and insightful weather information you can use for flight planning. 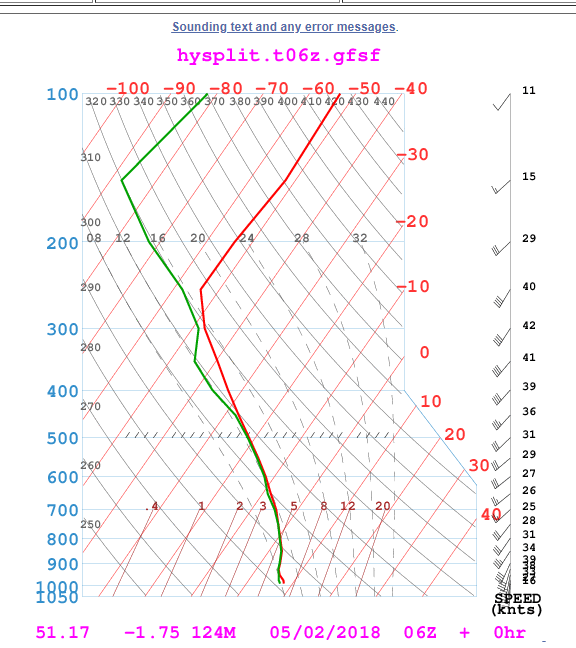 This is a useful little website from which you can easily access the latest TAFs and METARs. It includes many aerodromes across the UK. 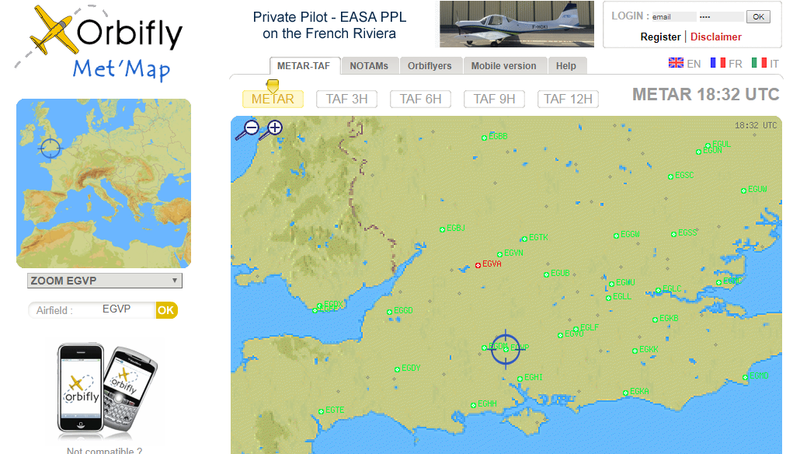 It’s very simple and intuitive to use and the data is displayed nicely including decoded versions of the METAR data. We haven’t tried it on mobile or tablet though, so it may not work too well on those devices.